Do you remember sometime last year when Xiaomi released their bezel-less smartphone, the Xiaomi Mi Mix? If you do, that’s great because there’s a similar device in the market, called the Doogee Mix. And if you are unaware, most smartphone makers have been releasing bezel-less phones as of late. Going back to the topic; let’s take a brief look at what the Doogee Mix has to offer, shall we? As this is a bezel-less device, the screen-to-body ratio on the Doogee Mix is pretty impressive at 76.24% and sees the display going off the top edge and the two opposite sides – right and left. In essence, the Doogee Mix is quite smaller than most other 5.5-inch phones. Also, this device is a “mix” of metal and Glass; giving it a premium look. Unlike the Mi Mix with a 6.4” display, the Doogee Mix sports a 5.5-inch display. The display type is super-AMOLED (reminiscent of Samsung devices) and display resolution of 1920 x 1080 pixels. A Gorilla glass 5 protection can also be found on the screen. Furthermore, there is a micro-USB 2.0 port at the bottom – a type-C USB port should’ve been better. Also, a fingerprint sensor is embedded in the home button at the front. It is worthy to note that there are two variants of the Doogee Mix, one with the MediaTek Helio P25 and another higher-end version with Helio X30. While the former features 4gigs of RAM and 64GB of ROM, the latter more expensive variant has 6GB of RAM and 128GB of internal storage. For software, the device runs on the latest Android 7.0 Nougat OS that offers a ton of great features. Combined with the powerful chipset, the Doogee Mix will have no problem handling most Android apps and games. The Doogee Mix has a dual camera at the back – one 16MP sensor and an 8MP sensor. At the front is a 5MP selfie camera, which is located on the bottom bezel – below the screen. Both camera setups also come with LED flash for more image exposure. And as with most dual rear camera phones, you have the capability to capture photos with the “bokeh” effect. To keep the Doogee Mix running is a 3380mAh Li-Po battery. The battery is non-removable and should offer great battery life for most users. Personally, I can’t find any major faults with this device, but a USB type-C port should have been great on the device. Besides this, the Doogee Mix is an excellent device and will be a nice competitor to the Xiaomi Mi Mix. 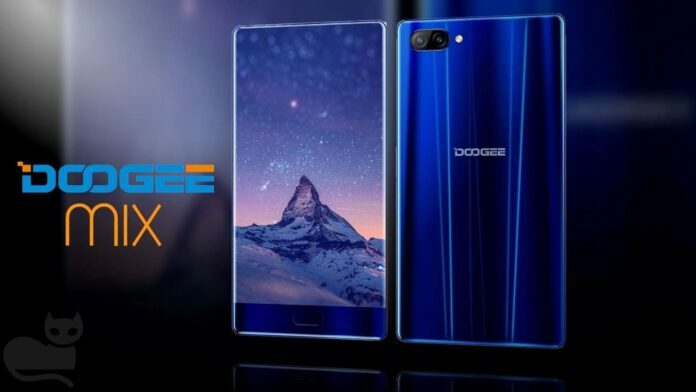 What is Doogee Mix Price and Availability Status? You can click on the links below to view the latest Doogee Mix price & availability.